I mentioned this cleansing oil back in a ‘currently loving‘ post in July and promised a proper review post. So here it is! I’ve long been a fan of cleansing oils, ever since I tried my first one and realised that actually, oil is NOT going to make your skin greasy, and if anything, it actually helps keep oil at bay as it cleanses without stripping, so keeps skin at a nice balance rather than stripped and producing oil to counter it! On a totally shallow note, I love this cleansing oil for the packaging design. It’s a pretty colour, and really sleek and expensive feeling. Plus it has a pump that dispenses product neatly, without any leakage or mess. 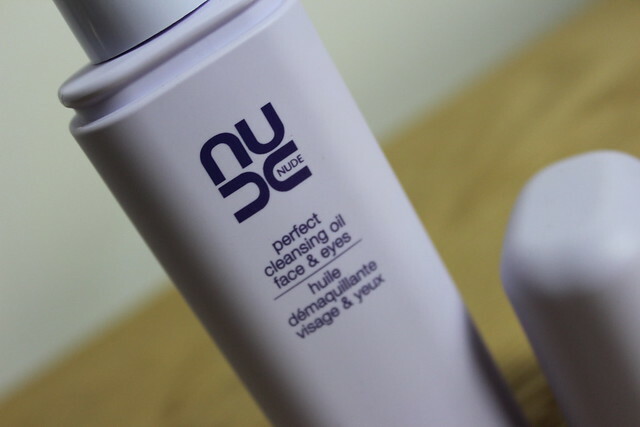 Always a plus side – and surprisingly hard to find with oil cleansers. My only niggle with the packaging is not being able to see how much if left, but overall – I love this style, it looks great and is one I’m happy to have ‘on show’ in the bathroom (plus it’s compact enough that it’s easy to transport around if needed. Beyond the aesthetics of the product, the oil itself – it’s quite thick but does really ‘melt’ into skin to help emulsify make-up and remove grime. But it definitely needs water to be warm to wash the oil off, when it’s tepid or cool it doesn’t ‘blend’ as well and makes rinsing it away a little harder work. So always make sure the water is warm to cleanse properly. I tend to use two to three pumps to cleanse my face and have been using this for around three months now on pretty much a daily basis and it’s not looking like it’s going to run out soon.